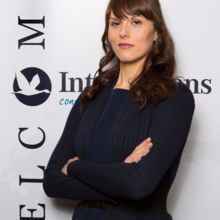 Spaniards abroad, especially those who are employed, pave their own paths — though many still find themselves missing home and have difficulty settling into their country of residence. 22% of Spanish expats don’t feel at home and doubt they ever will. Only 1% of expats from Spain are retirees. 92% work full time (vs. a global 84%). 48% are friends with mostly other expats. Compared to the global average of 24% of expats who have already been living abroad for more than ten years, Spaniards don’t quite follow suit: only 16% of Spanish expats report the same — rather, a good majority (65%) have only been in their new country for five years or less. What’s even more noteworthy is the percentage of Spaniards who do not feel at home and don’t think they ever will: compared to the global 15% average, more than one in five Spanish expats (22%) say as much. Though each expat experience is unique, perhaps this is due to a case of “too much of a good thing” for the Spanish: over a third (34%) have lived in at least three other foreign countries before. 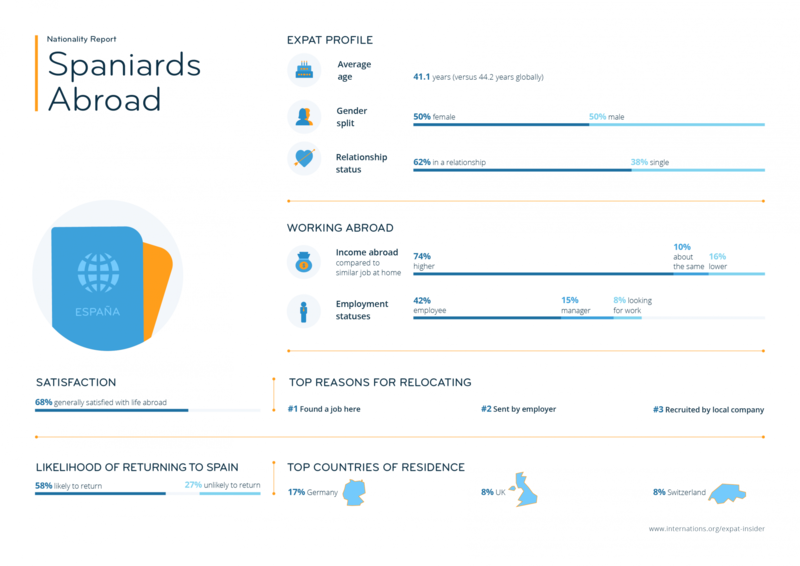 Spanish expats are 15 percentage points more likely than the average expat to return home at one point, and only 23% plan to stay in their host country forever (vs. 32% globally). Spanish expats seem to be quite motivated by language learning, though it does not always come easy. More than half the Spanish expats (53%) can speak the local language(s) of their host country at least fairly well — next to the 15% for whom it is the same as their mother tongue — which is seven percentage points above the global average (46%). Also above the average is the percentage of Spaniards who relocate abroad with the hope of improving their language skills: 17% of Spanish expats say this was one of the reasons for their move (vs. 11% globally). Despite an apparent desire for language learning, many Spanish expats do not always find it so easy: 28% of Spaniards do not agree at all that learning the local language of their host country is easy — exactly ten percentage points above the global average. Considering the fact that Germany is the top destination for Spanish expats (17%), and Germany ranks quite poorly for ease in language learning (51st out of 68 countries), this seems hardly surprising. Like their motivation in language learning, Spaniards are also typically committed to work. 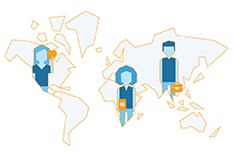 For the majority (53%), work-related reasons such as finding a job abroad or being sent abroad by their employer was the main motivation for the move; globally, this is only the case for 31% of expats. When looking at percentages of employees and retirees, Spanish expats don’t seem to go abroad to settle down: only 1% of Spanish expats are retirees (vs. 11% globally), and 42% are employees (vs. 25% globally). Spanish expats also stand out from the rest in terms of working hours per week: 92% of working Spaniards do so full time, as opposed to a net 84%. The Spaniards do, however, work fewer full-time hours than the norm: 42.9 working hours per week is the average for Spanish expats, against a global 44.0 hours. And as for popular fields of work? Manufacturing and engineering (13% vs. global 8%) as well as public sector employment (6% vs. global 3%) are overrepresented among Spanish expats. High incomes compared to back home as well as advanced levels of education also set Spanish expats apart. In addition to 7% who have a PhD, more than three in five Spanish expats (61%) have a postgraduate degree (either a master’s degree or similar) — 20 percentage points above the global average. Incomes for these well-educated employees also tend to be higher compared to those in Spain: 31% of Spanish expats report earning a lot more than they would back home; globally, only 25% of working expats also say this. Overall, 74% of Spanish expats report an income that is generally higher, compared to only 53% globally. Work is one category that really shines for Spanish expats, while relationships among Spanish expats don’t offer the most extraordinary results. Compared to 66% of expats in a relationship globally, only 62% of Spaniards report the same. Of the Spanish expats in a relationship, only 40% are completely satisfied with it, in contrast to 52% of respondents globally. Additionally, Spaniards are less likely to be in a relationship with another Spaniard (36% vs. 43% globally), and they are similarly less likely to have met their partner in their country of origin (37% vs. 49% globally). More than ten percentage points above the global average (34%), nearly half of Spanish respondents (48%) would describe their friends and acquaintances as mostly other expats. It comes as no surprise, then, that about half of Spaniards (49%) do not agree that making local friends is easy. These difficulties making local friends also play a role in the happiness of Spanish expats: 55% of Spaniards abroad who’ve rated their general happiness negatively say they don’t have enough socializing opportunities, and 52% report not having a personal support network in their new country — both factors that significantly contribute to unhappiness. Regardless of the level of education, the field of work, or the relationship status of the Spanish expat, one thing remains relatively constant: Spaniards are not too keen on leaving their home country’s favorable climate, as 44% say they considered the climate and weather a potential disadvantage of relocating (vs. only 21% globally).